Touch Me Not Balsam Site near Ferry Nab. This image, taken in October 2013, is of a clearing, choked with brambles, in a small wooded area on National Trust ground next to Ferry Nab. It is an important site for the "Nationally Scarce" Touch me not Balsam plant; the rare Netted Carpet Moth depends upon it for survival. Both the plant and the moth are to be found predominantly in the Lake District, but are restricted to just a few sites. Touch Me Not Balsam is an annual plant; it is intolerant of competition from other plants. This bramble patch has been encroaching more and more on the Touch-Me-Not stand so it is being cut back and pulled out . Dealing with the brambles will also cause lots of ground disturbance. Touch Me Not Balsam tends to grow very much better in disturbed ground. With the brambles pulled out or slashed back, many more Touch Me Not Plants should appear next Spring. In favourable conditions they form dense stands such as the one in the image below. Greater numbers of plants, on which the moths' caterpillars feed, should help maintain or even increase the annual moth populations. A good stand of Touch Me Not Balsam in July. Pulling out the brambles by the roots. The site, now almost clear of the brambles. 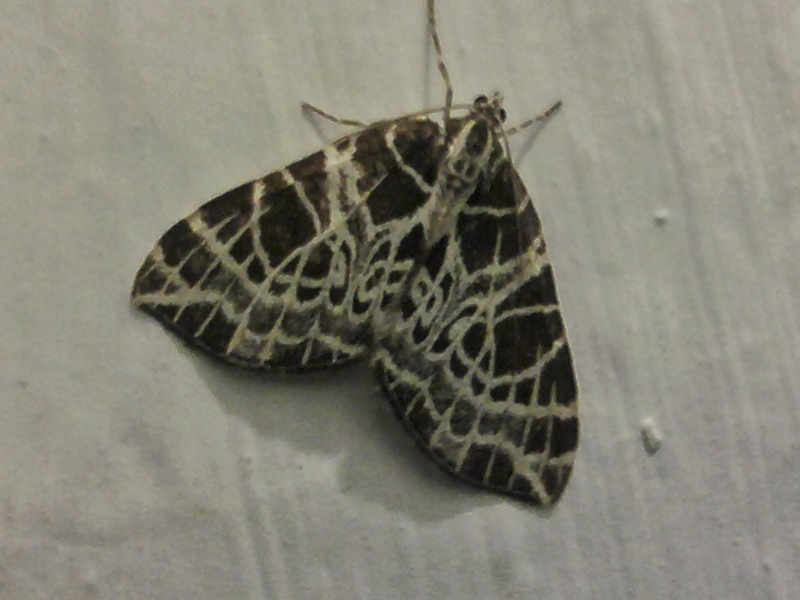 Netted Carpet Moth. Mid July. This post will be updated next Spring with a, hopefully good, progress report. 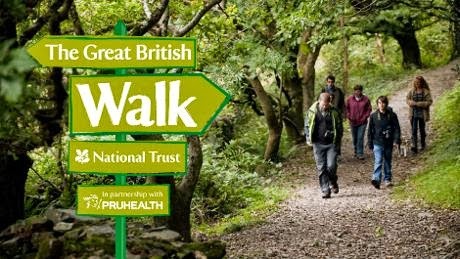 Discover secret places, stunning scenery, wonderful wildlife and hidden heritage by taking part in the Great British Walk 2013. There are walks for families, themed walks, heritage and wildlife walks, and suggestions for walks around our autumn gardens. The Easedale Round, starts at Allan Bank Grasmere GR NY 333077. Meet from 9am for a 10am start. Coffees & teas available (packed Lunches available for purchase) at Sticklebarn and meet at 0930 for a 10am start at Limefitt. Refreshments will be available at Allan Bank. A wet weather walk option that takes us around the valley will be available if the weather is not suitable for the high level routes in Langdale. Distance 3.3km, total ascent 399m, total descent 399m, total walking time 2 hours. Grade: mediumwalk mainly on footpaths. Leaving Sticklebarn at 1000 we walk up alongside Stickle Ghyll to picturesque Stickle Tarn where we can view the Langdale Valley far below, and the lofty pikes of Pavey Ark and Harrison Stickle. From here we cross Stickle Ghyll and walk a short way around the tarn until we start our route back via Tarn Crag back to Sticklebarn for well-earned refreshments. Distance 6.8km, total ascent 723m, total descent 725m, total walking time 3.5 hours. Grade: Hard steep walking in places but no exposure. Following a route up to Stickle Tarn we skirt the eastern edge before climbing the east side of Pavey Ark. After leaving Pavey Ark we visit Harrison Stickle and Pike of Stickle before crossing Loft Crag and ticking our 4th Wainwright of the day. We descend via Pike Howe past a couple of peat houses on the way back to Sticklebarn. Distance 7.2km, total ascent 619, total descent 623m , total walking time 4 hours. Grade: Hard steep walking in places but no exposure. This walk takes up the valley of Oxendale and up to Red Tarn via the Browney Ghyll path. From here we make for the summit of Pike Of Blisco before descending down the path via Red Acre Gill. Pike Of Blisco commands a fantastic view over the hills of Great Langdale and with it being separated from its neighbours and with a wonderfully rocky summit it gives the impression of being a proper mountain summit. Distance 15.4km, total ascent 1052m, total walking time 6.5hours. Grade Hard – steep in places but no exposure. We walk up The Band to the Bowfell summit for splendid views down into Langdale and over to Scafell Pike to our left. We then walk to Esk Pike (our second Wainwright) before starting our descent to Esk Hause , Angle Tarn and into Mickleden for our return to Sticklebarn. Distance 11.9km, 737m ascent, total walking time 4.5 hours. Grade Medium – no steep slopes or exposure. We leave Allan Bank to head towards Silver Howe before heading north west skirting Langdale to our left. As we reach Codale Head we start our return journey via Codale Tarn to Belles Knot and passing peaceful Easedale Tarn. We follow Sourmilk Gill down its path to Easedale and return to Allan Bank. Have you ever had that massively embarrassing moment when someone asks you "what is your favourite basidiomycete?" and you answer with orange peel fungus - only to be laughed right out of the building because you've just named a ascomycete? Here is my bluffers guide to fungi; how to survive a conversation with a mycologist (fungi expert) and be able to leave the room with your dignity intact. I have tried to avoid all scientific names and technical references as these can always be looked up afterwards. 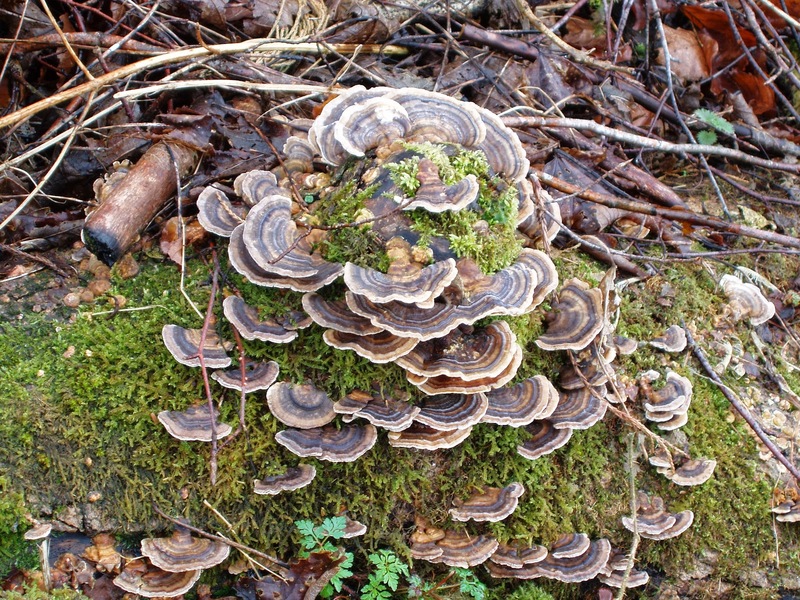 What is the difference between fungi, mushrooms and toadstools? Mushrooms and toadstools are both nick-names for fungi which are the classic cap-on-a-stem shape. Mushrooms were the edible ones and toadstools the poisonous ones. What you see popping up through the ground this time of year is the fruit of the fungi; this is how it disperses its spores (seeds). Think of fungi as a massive root system, just like that of a tree except much finer. These roots can spread huge long distances underground and live for over a thousand years, with the only tell-tale that fungi are below ground is that of the fruiting bodies. Waste. The earth would be a huge pile of waste if it wasn't for these little guys that break it all down into microscopic nutrients which go back into the soil and are used again by plants and trees. 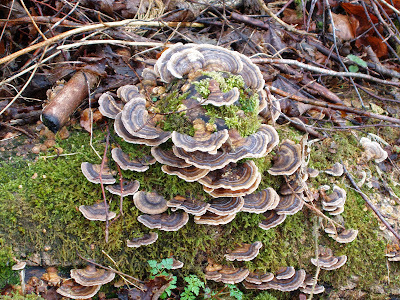 Fungi will digest leaf litter, dead wood, dead bodies and dung, thank goodness. To put that into figures; a woodland the size of a football pitch will produce over 5 tonnes of waste in the form of leaves and fallen wood every year which will all be consumed by enough fungi to fill a convoy of dumper trucks. Some however are parasites, these like to live off living things like trees and also grubs that are below the ground. Good question. According to Peter Marren (2012) on why they are poisonous: "There is no imaginable advantage to the mushroom being so," "it's ability to poison human beings is accidental". There are so many different types, how do I identify them? Just like with plants - where different plants will grow in different places, the same can be said with fungi. Each different place, or habitat as it's called, will vary in the soil type, the tree species, the type of grass, and what is around to feed off. For example, some fungi love conifer woods, some prefer woods with native trees in, some love old grasslands, some like specific trees such as beech, some might feed off other fungi and some will be found in towns, growing up out of the pavement! So the first thing to do is work out what habitat the fungi is in, and second what it is feeding off. Tip: Having more than one fungi ID book is a good idea, as one book might not have the right picture for you. Fungi look different from day to day and it all depends on when the photos were taken. I'm not following the usual classification of fungi here, for the real ways to pigeon-hole them please refer to a good book. This is merely a beginners guide. Many zoned polypore. A common fungi found on deadwood. Beefsteak fungus. Found on old oak trees. These are fungi which are attached to the roots of trees. The fungi give the tree nutrients from the soil and the tree with its leaves can provide the fungi with something it cannot make itself - carbohydrates. These fungi are called mycorrhizal fungi and they all have thier prefered type of tree to link up with. Identify the tree and it'll give you a good clue what type of fungi you're looking at. The birch bolette, a mycorrizal fungi found near, you guessed it, birch. This is a relative of the famous Fly Agaric, part of the amanita family and is found in mixed woods, meaning woods with both conifers and broadleaved trees. These include the colourful little gems seen growing in ancient grassland which doesn't get fertilised or ploughed and has fairly short grass, usually kept short by sheep. These are called wax-caps. Other whitish coloured fungi that can be seen growing in grass often produce big cirles called fairy-rings. The mushrooms mark the extent of the underground root system. White spindles seen here in grass that is carefully looked after. There are lots of fungi that don't follow the usual mushroom shape and must be in competition with each other to look like something landed on earth from space. The yellow brain fungus, here on an ash tree is actually feeding off another fungus found on its bark. Coral fungus, here in a wood of beech and oak trees. These can be tiny and easy to miss when walking through grass or woodland. However some are bright orange which helps a lot. So there you have part 1 of this light-hearted look at something that I find interesting at this time of year. If you fancy finding out more there are some great books out there including ones by Roger Phillips and Peter Marren. Look out for more photos that will be added to this blog over the next few weeks. The Gate to St. Catherine's. The decorative cast iron gate at the main entrance to St.Catherine's. BEFORE, DURING, AND AFTER ITS REPAINT.